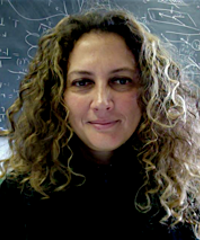 Congratulations to Professor Sema Salur for receiving the National Science Foundation Research Award for “Manifolds with Special Holonomy and Applications” (2017-2020). Her research in differential geometry and geometric analysis has been funded by NSF grants since 2008. The unification of the four fundamental forces of nature—electromagnetism, gravity, the strong and weak nuclear forces—is one of the greatest unsolved mysteries of physics. Over the last few decades, M-theory, a “theory of everything,” has emerged as a candidate for the unification of these forces. Salur’s current project is about manifolds with special holonomy, which are spaces whose infinitesimal symmetries allow them to play a crucial role in M-theory “compactifications.” That is, they model the tiny “curled up” dimensions lurking at every point of spacetime. Her project will focus in particular on 6-dimensional Calabi-Yau manifolds (which play the analogous role of the curled-up dimensions of superstring theory) and spaces of dimension 7 and 8, whose symmetries fill out the special groups known as G2 and Spin(7), respectively. Despite extensive research on Calabi-Yau manifolds, the geometric properties of G2 and Spin(7) manifolds are not well understood, and the problem of the existence of calibrated (i.e., volume minimizing) submanifolds is still wide open. One goal of this project is to develop techniques that are robust enough to handle these difficult existence questions. Another goal is to study and understand the deformation spaces of calibrated submanifolds, which will be useful for M-theory compactifications. Salur will continue to supervise PhD students. In addition, through advising, seminars, special sessions, conferences, and “Women in Math” workshops, she intends to support women and members of other under-represented groups in their pursuit of graduate study and research careers in differential geometry. Learn more about Salur’s academic background.